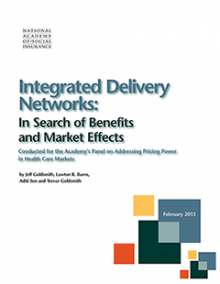 Abstract: Any examination of the role that hospitals play in health care cost growth is complicated by the fact that in many large markets, hospitals may be part of integrated delivery networks (IDNs), either vertically integrated health services networks that include physicians, post-acute services and/or health plans or fully integrated provider systems inside a health plan. Looking at the benefits to society, the authors found that there is evidence that IDNs have raised physician costs, hospital prices and per capita medical care spending; looking at the benefits to the providers, the evidence also showed that greater investments in IDN development are associated with lower operating margins and return on capital. As part of this report, the authors conducted a new analysis of 15 of the largest IDNs in the country. While data on hospital performance at the IDN level are scant, the authors found no relationship between the degree of hospital market concentration and IDN operating profits, between the size of the IDN’s bed complement or its net collected revenues and operating profits, no difference in clinical quality or safety scores between the IDN’s flagship hospital and its major in-market competitor, higher costs of care in the IDN’s flagship hospital versus its in-market competitor, and higher costs of care when more of the flagship hospital’s revenues were at risk. The authors conclude that the public interest would be served if IDNs provided more detailed routine operating disclosures, particularly the amount of hospital operating profit as a percentage of the IDN’s total earnings and the IDN’s physician and hospital compensation policies. How IDNs allocate overhead and ancillary services income between the three main lines of business should also be disclosed. It should also be possible to determine from an IDN disclosure if capitated risk is transmitted from the IDN’s health plan or risk-accepting organization to its hospitals and physicians. Analysis of societal benefits would also be materially aided by a comprehensive, national all-payer claims database.